Strand7 Release 2 is the most significant new release since Strand7 first became available. The release includes fully automatic mesh generation of surfaces and solids, in addition to compatibility with CAD formats such as IGES and SAT. Following is a summary of all the new features in this release together with a preview of some of the new features you can expect in future releases. As always, all new features in Strand7 are seamlessly integrated into the Strand7 environment. Any models created in a previous release of Strand7 are fully compatible with Release 2.1. Models created or saved in Release 2.1 cannot be opened in any previous release. Release 2.1 requires a new authorisation key. The Strand7 Release 2.1 distribution files includes a PDF containing a number of fully documented automeshing tutorials. It is strongly recommended that you peruse these tutorials before embarking on any automeshing activities. 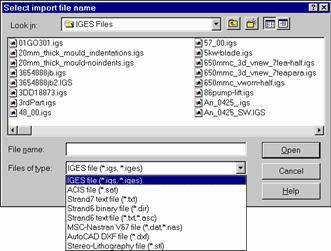 You can now import IGES geometry files as well as SAT geometry files. The data in these files are imported as true geometry and can be stored in the ST7 file. 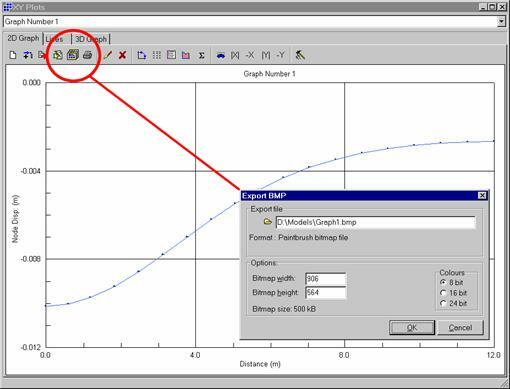 Geometry data is used by the automesher for generating elements, and can also be manipulated directly in Strand7. The surface mesher uses a paving technique to generate high quality quadrilateral elements. The mesh that is generated can be a plate mesh for solving with plate elements or it can be the outer surface mesh for a solid model to be meshed with tetrahedral elements. The solid mesher uses a surface (plate) mesh to generate tetrahedral solid elements. Both linear Tet4 and quadratic Tet10 elements can be generated. 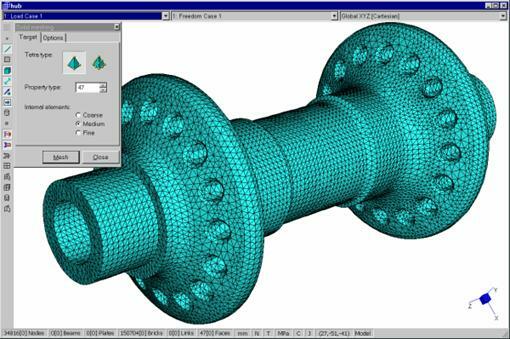 Unfortunately not all CAD data is suitable for automatic meshing and it is rare that a CAD file can be automeshed without any type of geometry preparation. 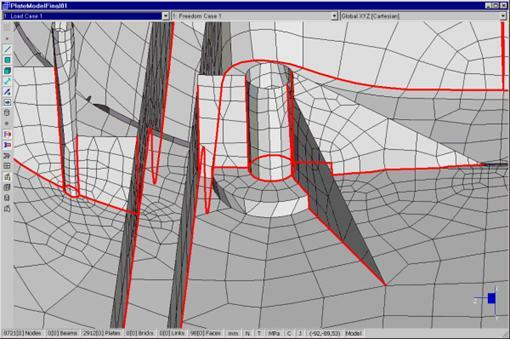 Strand7 Release 2.1 includes various tools to assist with geometry repairing and feature removal, to make the geometry more suitable for automatic meshing. In particular, you can seam mismatched faces, automatically detect and assign T-junctions and remove small features. Vertices define the start and end of edges, which in turn define the geometry faces. In Strand7, a node is always generated at a vertex, so by creating additional vertices along an edge, you can enforce the creation of nodes at specific locations. Extra vertices on edges are also useful whenever you need to zip two edges together. Vertex Type - Free or Fixed. A free vertex may be removed by a geometry cleaning operation, whilst a fixed vertex can be removed only manually. This provides a very powerful mechanism for assigning the mesh size anywhere along an edge. It allows you to override any of the default meshing settings at specific vertices and therefore accurately control the mesh size along an edge. 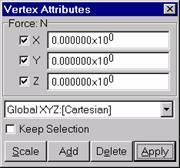 In particular, if you assign a Vertex Mesh Size attribute to both vertices of an edge, then the element sizes along the edge will be linearly interpolated between the vertex values. 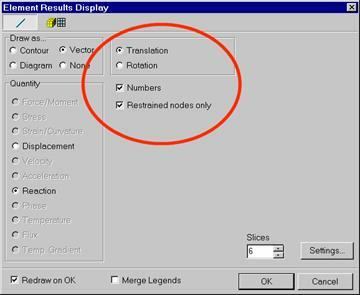 Most of the attributes that can be assigned to nodes can also be assigned to the vertices. 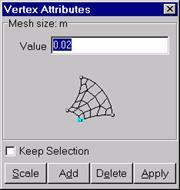 Such vertex attributes are then automatically transferred to the nodes upon meshing. This relates to the interpolation of nodal attributes along edges where both vertices have been assigned an attribute. For example, if you assign a restraint at each vertex on an edge, then for the interpolated edges, all nodes generated along the edge will inherit a nodal restraint value interpolated between the values assigned at the vertices. If the edge type is Non-Interpolated, then only the nodes corresponding to the vertices are assigned attributes, the intermediate nodes are not. 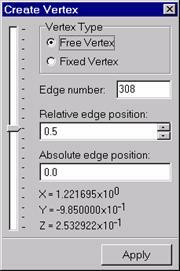 Most of the attributes that can be assigned to a plate edge may also be assigned to a geometry edge. 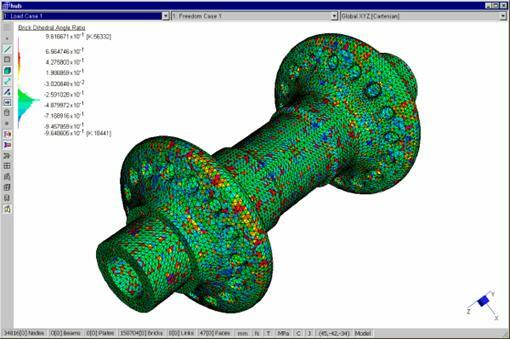 Such attributes are then automatically assigned to the respective plate element edges upon meshing. 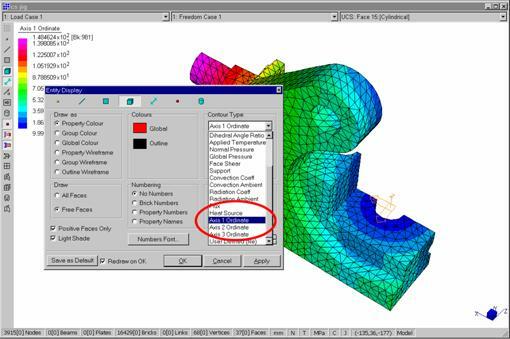 To facilitate the application and definition of plate material properties, you can assign property numbers to each geometry face in the model. These property numbers are then automatically assigned to the resulting plate elements generated by the surface mesher. This avoids the sometimes-difficult task of assigning plate properties to complicated regions. Most of the plate attributes (such as pressure, support, etc.) may be applied directly to geometry faces. This greatly simplifies the task of assigning loads to the elements because all elements generated on a face are automatically assigned the attributes of the face. Furthermore, whenever a plate mesh is used to generate a solid brick mesh, plate surface attributes such as plate pressure, are automatically transferred to the surface of brick elements. Geometry can be copied, scaled, moved, mirrored or deleted. Strand7's internal clipboard can be used to perform cut-copy-paste operations on geometry. This is available within the same model or to transfer geometry from one model to another. This operation is aware of units so that if you copy something that is 100mm long from a model with mm units, and you paste it into another model which has m units, the pasted geometry will become 0.1m long. With the inclusion of geometry data in ST7 files, file sizes can increase dramatically and therefore opening and saving of such files can take a relatively long time. In Release 2.1, there are significant improvements to these functions, particularly when opening and saving files across networks. 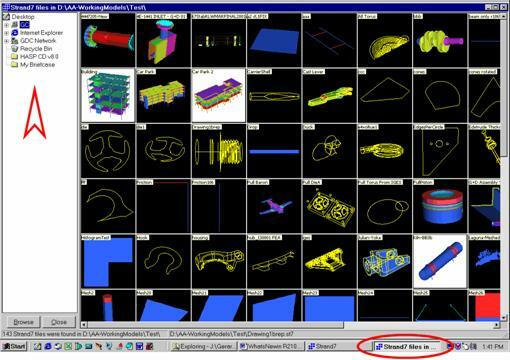 The Strand7 model browser can now sit on the task bar for easy access, subsequent to a browse. The browse tree has also been extensively updated and now is very similar to Windows Explorer, allowing you to browse networks and the desktop. It is often useful to select a series of entities that are topologically connected. This is especially true for geometry imports consisting of assemblies. The Select Connected option allows you to select entities connected to a specified master entity. This new display option identifies plate element edges where more than two plates connect. A typical case is the intersection of the web and flange on an I-beam constructed from plate elements. 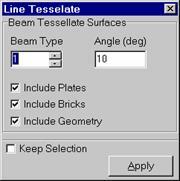 This display option is particularly useful for debugging surface meshes to be used for solid meshing. 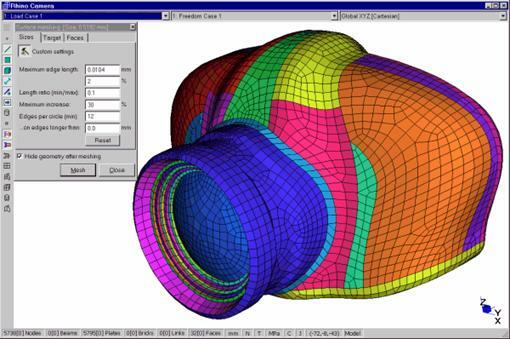 Such meshes must be strictly "manifold" to be suitable for solid meshing. Manifold means that all plate edges are shared by two and only two plates. This is an extremely useful display option for identifying mismatched geometry faces and is one of the most used options when preparing geometry for meshing. 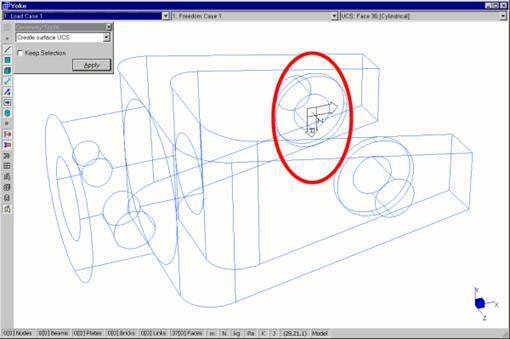 Similarly to the Face Free Edge option, this option is used during the geometry preparation phase. For geometry describing a solid object, no face T-junctions should exist. The existence of face T-junctions indicates a non-manifold geometry. Non-manifold geometries are meaningful for plate meshes. 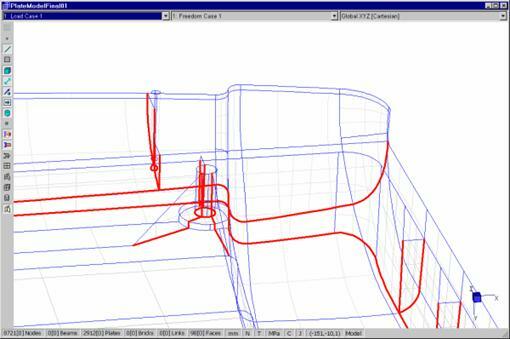 Plate and brick models in Strand7 can now display contours from a user-prepared TXT file. The TXT file contains the data to be contoured. This feature makes Strand7 more useful to users of other applications who wish to use the Strand7 pre and post processing environments to construct meshes and view results generated by other applications. For both plate and brick elements, three file formats are supported: a file of nodal values, a file of element Gauss point values and a file containing nCode� fatigue results. 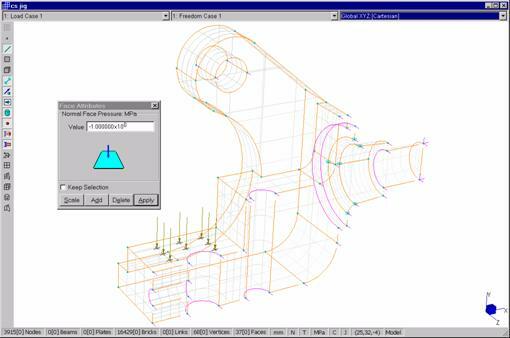 The nCode� fatigue results option can be used to import nodal values of fatigue results. 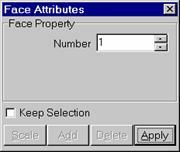 The nCode� single-column, 6-column and 12-column ASCII formats are supported. 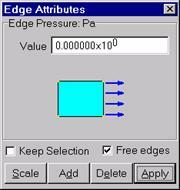 Edge based attributes such as Edge Stress can now be contoured. This contour type contours the elements based on an ordinate value in any UCS. For example, you could contour the radial position of plate elements by defining a cylindrical UCS and choosing Axis 1 Ordinate. With the introduction of the automatic mesher in this release, it is now even more important to thoroughly check the quality of elements before solving the model. 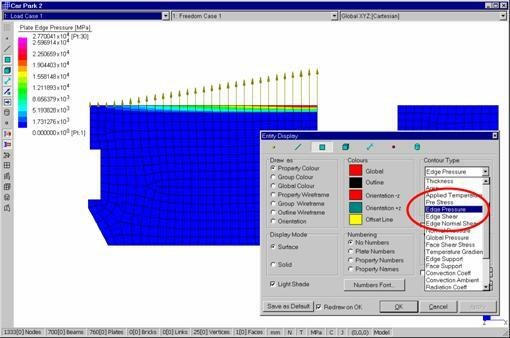 Brick element models can be even more difficult to check than plate models, but the inclusion of these new contour options can simplify the task. The dihedral angle ratio is a signed, non-dimensional value indicating how far from an optimal value the angle between two adjoining faces is. For example, in a hexahedral element, the best dihedral angle is 90 deg. For a tetrahedral, it is approximately 70.5 deg. A dihedral angle ratio of zero indicates a perfectly formed element. A ratio of -1 indicates an angle of zero degrees and a ratio of +1 indicates an angle of 180 degrees. The mixed product contour gives a value ranging from zero to one, to provide a measure of the face angles at each corner on the element. For a collapsed corner, the value is zero. For a right-angled corner, the value is 1. The mixed product is calculated by taking the vector triple product (or mixed product) of the three vectors defined along the edges meeting at a point (or corner). This contour type contours the elements based on an ordinate value in any UCS. 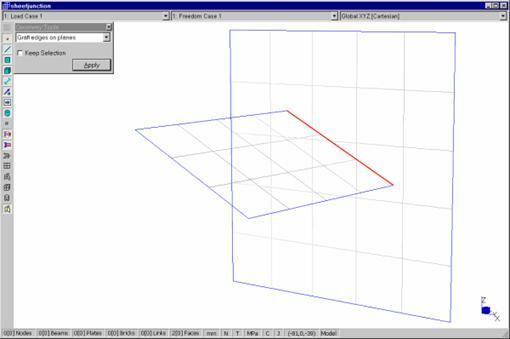 For example, you could contour the radial position of brick elements by defining a cylindrical UCS and choosing Axis 1 Ordinate. 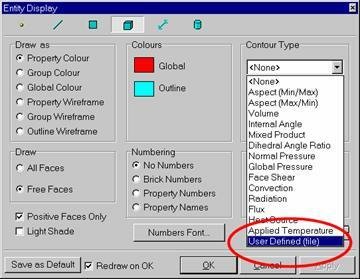 A new option on the contour settings, the Histogram option, indicates the distribution of the contour values over the mesh. The width of the contour bar is directly proportional to the number of elements contributing to that particular contour range. 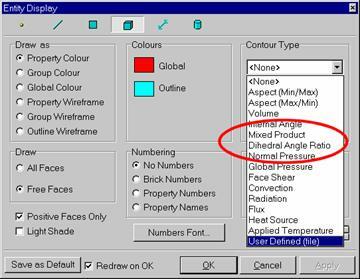 For example, when contouring brick dihedral angle ratios, the histogram option indicates the proportion of elements in the acceptable range and the proportion of badly shaped elements. The histogram option is available across all contour displays, including result contours. 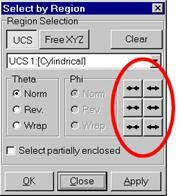 The operation of the select by region nudge buttons has been improved to provide better control when single clicks are applied. The entries in the Global Acceleration Dialog can be exported to a file and subsequently imported into another model. The exported file is units-aware so it can be imported into any Strand7 model. In the last Strand7 release, an option became available to generate a self-running animation file. In Release 2.1, a new freely distributable "SAF Player.exe" program can be used to view any Strand7 SAF file. This may be more efficient than generating self-running animations since the SAF files are smaller than the equivalent EXE files. With the inclusion of the geometry capabilities in Strand7, the import of CAD files does not generate beam elements along the geometry edges. To generate such elements, you can now use the Line Tessellate option on selected faces. When modelling with plate elements, CAD files often contain surfaces where the edge of one face lies on the surface of another, but they are topologically disconnected. The Graft Edges on Plane tool provides some functionality to "weld" the edge of one face to the surface of another face. In this release, the limitations to this function are that the edge must be a straight line and the mating face must lie on a plane surface. These restrictions will be eased in the next release. Often we need a UCS at a specific geometric feature in our models. 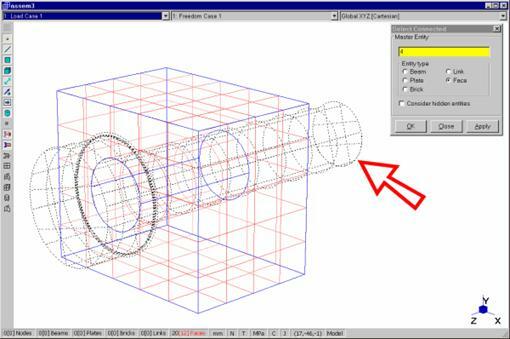 For example, if you import a CAD model containing a circular hole, a cylindrical UCS on that hole is useful for specifying boundary conditions or loads. 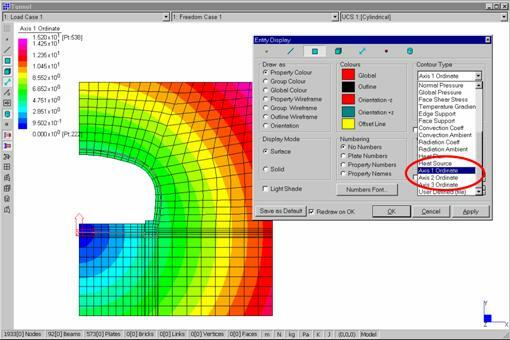 The Create Surface UCS tool allows you to select a face and automatically generate a UCS representing the underlying surface. 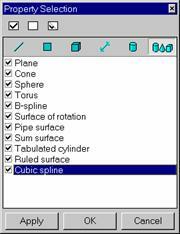 Note that this feature is only available for analytical surfaces (such as plane, sphere, torus, cone, etc. ), not for spline surfaces. 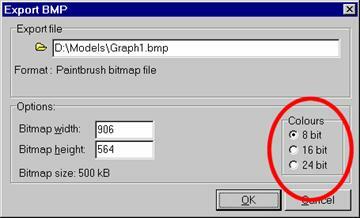 The results graphs window now provides an option to export the graph to a BMP file. This is useful because you can generate BMP files of virtually any size for inclusion into other documents and you are not limited to capturing a screen dump. This function now gives the option to generate bitmaps in either 8-bit, 16-bit or 24-bit formats. 8-bit formats are particularly useful for images without much colour as they are considerably smaller than the other formats and therefore more suitable for pasting in reports. All Strand7 print previews can now be copied to the Windows clipboard, for easy pasting into other applications. 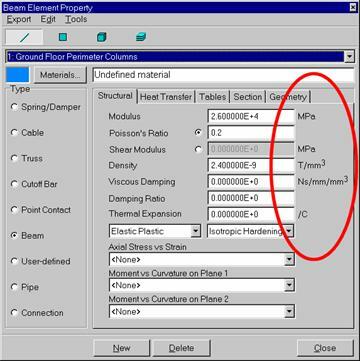 This option can facilitate the generation of technical reports by allowing you to directly paste the Strand7 generated page into another application. As this is a bitmap transfer, the quality of the pasted image may not be as high as a direct print to a high-resolution printer, but if you copy the Strand7 generated page with a high zoom factor, images of reasonable quality are generated. A new option prevents the drawing of reaction vectors on unrestrained nodes. Reactions at unrestrained nodes should be zero, however due to roundoff, they are usually a very small number. If these reactions are displayed, the plot can be difficult to read. Not showing these reactions greatly clarifies the display. Property input dialog boxes now display the units of all entries that are unit dependent. Previous versions of Strand7 stored ambient temperature values in the element's property sets. This meant that if different regions of a mesh required different ambient conditions, new property sets were required. 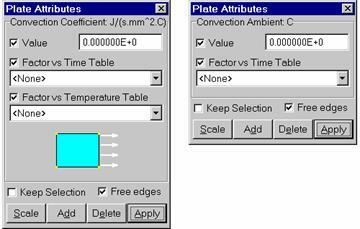 As of Release 2.1, ambient conditions are applied in the same way as the heat transfer coefficients, using the attribute marking tools. This allows you to assign the coefficients and the ambient values independently of each other and independently of the property sets. Note that if you have a Strand7 model generated in a previous release, it will be automatically converted to the new format upon opening - changes to the model to the new format will only be permanent if you save the model in this release. In previous releases of Strand7, base acceleration was applied via a non-dimensional Factor vs Time table, multiplying the acceleration values directly. In this release, Acceleration vs Time tables may be defined in acceleration units and the acceleration factor in the solver dialog box becomes non-dimensional. This approach allows you to store and retrieve ground acceleration histories that are units-aware and use these in any model, irrespective of the model's units. In this release, we have included a number of earthquake time-histories (located in the ..\Strand7\Tables folder), from Japanese, Greek and El-Centro earthquakes. These are now also units-aware, so you can store and retrieve your own stress-strain tables and then use them in any model, without having to consider the units of the model. In this release we have included a few sample stress-strain tables (located in the ..\Strand7\Tables folder) for your use - please ensure they are suitable for your requirements before using them. 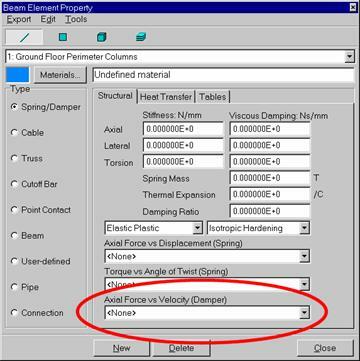 This new table type allows you to define a damper with a nonlinear relationship between force and velocity. This is analogous to assigning a nonlinear force vs displacement table to the spring part of a spring-damper. 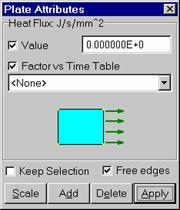 Heat flux attributes applied to beams, plates and bricks can now be assigned an optional Factor vs Time table which allows you to vary the flux as a function of time, whenever the nonlinear transient heat solver is used. A new file import option is available for importing STAAD-III and STAAD-Pro text files. This facility is released as Beta as not all STAAD options are currently supported. If you have any difficulties using this, or you wish to provide some feedback, please contact us as this will help us to enhance it's functionality. This release includes new section libraries for Japan, Korea and South Africa, together with a series of ASME pipe sections. Setting up Strand7 to run in a networked environment will now be even easier due to a new St7Config utility. 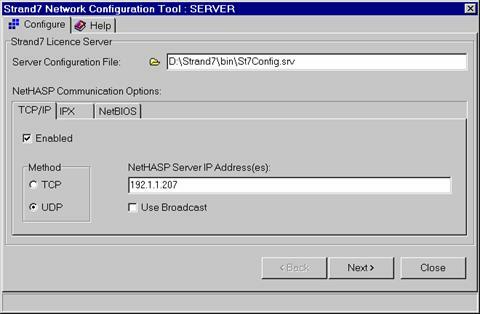 The utility is a standalone program, which can be used to configure both the client side and server side of Strand7, and install all the necessary drivers for the NetHASP device. As most of you know, we are continually developing Strand7 and at any time we have a number of development projects running concurrently. Below is a preview of some of the features you can expect in upcoming releases. An upcoming version of Strand7 will allow you to use OpenGL as the rendering engine. 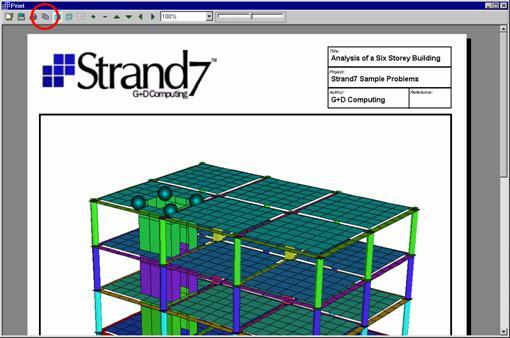 At present, Strand7 performs all its rendering functions internally in software. Using OpenGL, significant improvements in display performance can be achieved provided you have installed an OpenGL graphics card on your system. Typically, rendering can be 10 times faster with an OpenGL card. Geometry cannot be created directly in the current release of Strand7. 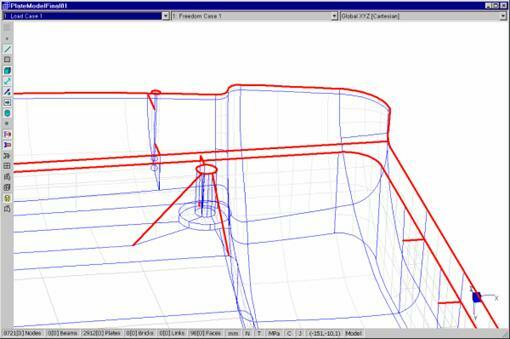 At present this geometry must come from a CAD system via IGES or SAT file formats. A future release of Strand7 will provide CAD-like tools to generate arbitrary geometry and perform a number of boolean and intersection operations.